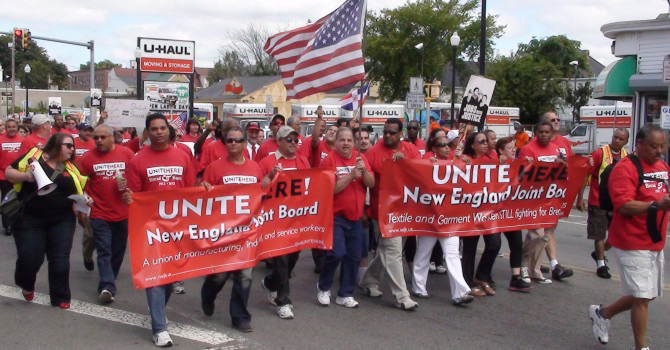 The New England Joint Board UNITE HERE is a union representing workers in the textile, garment, manufacturing, warehousing, laundry, human service, and hospitality industries in New England and New York. Our thousands of members are as diverse as the industries they work in. Women make up a large portion of our membership as do new immigrants and people of color. A large portion of our current membership was originally organized by our predecessor unions the ILGWU (International Ladies’ Garment Workers’ Union) and ACTWU (Amalgamated Clothing and Textile Workers). We carry the tradition of organizing workers in traditionally low-wage industries, bringing them and their families into well-paying middle class jobs. Our members work in cafeterias, factories, retail stores, distribution centers, industrial laundries, offices, group homes, casinos, and mills. We are proud of our heritage and of our current status as an evolving union fighting for the rights of ALL workers.